Check out Dana Nicorski’s testimonial about his Mangum 28′! I purchased my 1976 Maltese Magnum from the original owner in 1989. He would not complete the sale until I built a garage to keep her in. This is certainly a boat worth taking care of and I have tried my best to keep her in original condition. It’s amazing the effort that went into building my Magnum. The hull and hardware simply do not age. The boat is as seaworthy as the day I got her. The hull is amazingly balanced and rides flat and smooth in even very rough seas. 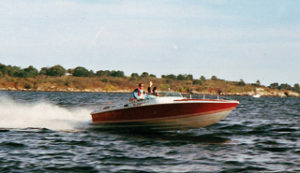 In a poker run a number of years ago, I won two trophies: Most Classic Boat and Best-Looking Boat. I am sure I could win the same two trophies today.